to record their family history. A simple to use program to record your Family Tree. Trying to choose a program? Considering the possibility of switching programs? Already using RootsMagic and interested in the more advanced features? Come along and see if RM might be for you. Users of all versions welcome, bring your laptop/plugbox. Comments or questions are welcome, as are suggestions for topics to be covered. Venue has changed to the Totara Room at the KCC for November 2018. 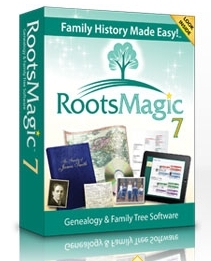 RootsMagic to/from Ancestry.com interface has been released – and will be the main topic for our June meeting. Free upgrade to your current version. and/or an opportunity to to win an Ancestry subscription. Next session: this Saturday, 20th May 2017, 1:30 to 3:30, doors open at 1pm, $3 door fee. It doesn’t look as though the promised (optional) link from RootsMagic to/from Ancestry will be available for that meeting, but must be coming soon! Bring along your suggestions on getting the most from RootsMagic, and/or your questions. de facto or fleeting partners, illegitimate children…. Using Groups is on the list. Any spare time after questions have been answered can cover an aspect of the (optional) Family Search integration. Perhaps you could come prepared to share with us your favourite use of these (or any other) features? Did you see the latest RootsMagic newsletter? Bring along your questions for the May meeting (Sunday 15th May 2-4 KCC). The March workshop demonstrated RootsMagic, May will be devoted to Q&As, with any spare time left highlighting a particular feature.